scans_daily | There's been a humor in the tone of Flash Gordon: Kings Cross. There's been a humor in the tone of Flash Gordon: Kings Cross. It's not one out of tune with the rest of Dynamite's work featuring King Features characters. It's one that's a little more apparent, because of the exaggeration of Jesse Hamm's art. The lightness of Jeff Parker's writing is also a bit more so than previous efforts. There's a couple of bits in last week's issue #4 that show off both particularly well. 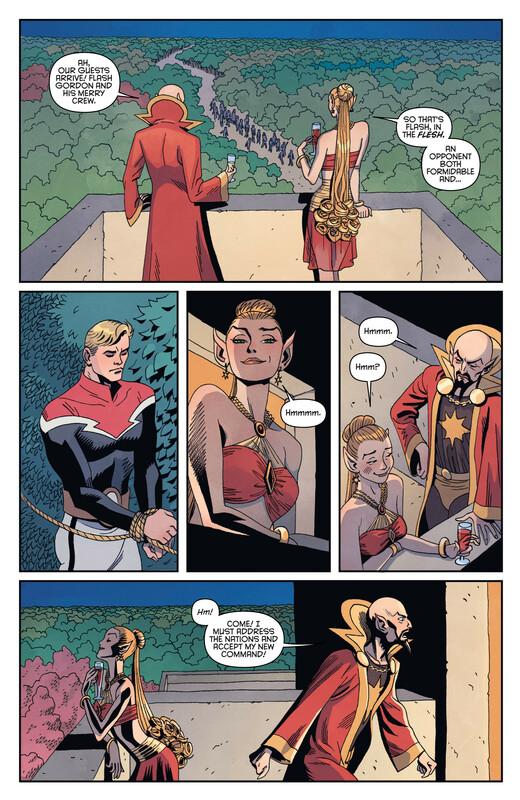 The first's Ming the Merciless and his loyal daughter Aura watching Flash and friends being led in..
.. and having a conversation that isn't entirely words. 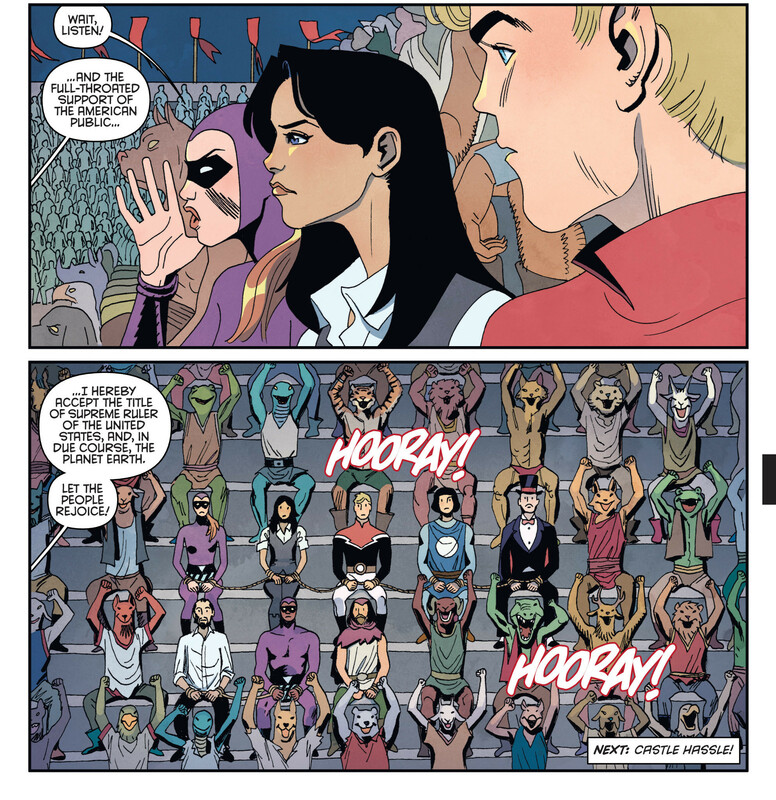 The second's Flash and friends in the audience, listening to Ming accept a rulership he won with the use of a bioweapon and the promise of its reversal. (Those " ..well. " expressions are a bit indistinct, but they're the more effective for that. If you're wondering, to Flash's left's Prince Valiant, who came through time, and Mandrake the Magician. To Flash's right's Dale Arden and the 23rd Phantom, Jen Harris. The 22nd fell in the course of his duty during Ming's first attack on Earth. Right below Flash's Jungle Jim, whose Dynamite version spent time in the forests of Mongo and has sort-of-Swamp-Thing-and-the-Green powers. To Jim's right's Mandrake's friend Lothar, also the 23rd Phantom- there's a bit of a story there. The whole concept of the Phantom revolves around the belief that the Phantom is one immortal man, the role secretly handed down through generations to maintain that mystery. There being two Phantoms together in one place, one of whom is a black man and the other a white woman, would make that a wee bit more difficult to maintain. ..How do they explain when Phantom turns from a man to a woman/black man? I don't know how they explain it but I'd think it would be pretty easy to roll your eyes and go "Of course your Western historians assumed I was a white man!" Alternatively, if your belief system can accept an immortal in purple tights, I can't imagine it's not flexible enough to accept an immortal shapeshifter in purple tights. How are these two related to the comic strip Phantom (the 21st, Kit Walker)? Was 22 21's son (also Kit Walker).? ...and all the stuff vspope said. How did they completely miss the point of the Phantom? Oh well at least the Phantom of 2040 (number 24?) will be another Kit Walker. In fairness, there has been a female Phantom in the distant past, written by Lee Falk himself. So there is precedent. Or that there's a Phantom wiki....though I shouldn't be surprised.